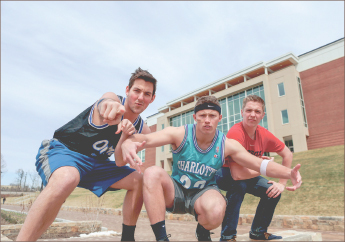 Earlier this spring, a handful of guys from dorm 7-2 at Liberty University were dunking on a miniature basketball goal they had laying around their dorm when Cabot Phillips had an idea. Inspired by the dunk pranks made popular on Vine — holding a goal over a blissfully unaware victim’s head and posterizing them, sneak-attack style — Cabot Phillips, his twin brother Hudson Phillips and friends Timmy Steffens, Christian Glackin and Jon Milograno decided to give the video a shot (no pun intended). No stranger to viral videos — Cabot Phillips was also behind a clip of a friend catching a fish with his hair — the group put substantial thought into the project. They gathered dunk ideas and spent one day gauging the reactions of their unsuspecting participants. Sufficient positive responses gathered, the guys decided to make a full video — one much longer than the six seconds of fame the prank usually garners — that involves several famous faces of Liberty. They dunked on Flames football Head Coach Turner Gill, courtesy of some assistance from his daughter, and Campus Band’s Justin Kintzel. The highlight of the video, though, was an appearance by Flames power forward Drew Smith, who has appeared in SportsCenter’s Top 10 Plays twice. “I didn’t know him, but I’ve been to basketball games and knew if we were going to make the video, we had to have someone like Drew doing it,” Cabot Phillips said. On a whim, he fired off a Facebook message to Smith. To his surprise, Smith not only responded the next morning but was excited about the idea. Now, more than 23,000 YouTube and 300,000 MSN views later, all the work that went into the making of the video has more than paid off, according to Cabot Phillips. Not motivated by class credit or career goals, Cabot Phillips said he enjoys making videos, and the group plans on making more. Cabot Phillips explained that because he does not intend to pursue anything in the film or media realm professionally, the project was nothing more than good, clean fun. He said the video was, first and foremost, a sort of celebration for the dorm as a whole. While the simple idea for that hurrah turned out to be a slamming success — literally, it is unlikely it will be as final as Cabot Phillips’ group previously thought. Their growing fan base is clamoring for more videos, and the guys of 7-2 plan to deliver.